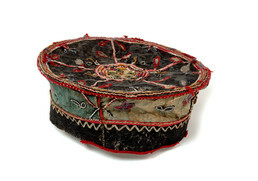 Circular skin caps like this one were everyday headgear for men in the 19th century. The shape is Russian but the decorations are Sugpiaq. They include strips and cutout shapes made from dyed sea lion esophagus, and decorative stitching done with caribou hair, sinew, and yarn. The leaf and petal designs may have been inspired by European embroidery.